We set intentions; we formulate goals; we yearn and hope for “that thing to happen” or that state to be achieved, that shift to occur so that things will be different, a new way. And it a mystery from an energetic perspective how we get from here to there. I had a client who was working intensely with those questions, and I wanted (with her permission) to share the shamanic healing journey we did together to ask the spirits about “getting from here to there”. The sacred landscape opened up with a forest grove and a stream. We peered down into the stream, and then across the stream to the other side. There was a three-dimensional quality about this metaphor of the two banks of the stream and the source of the stream. 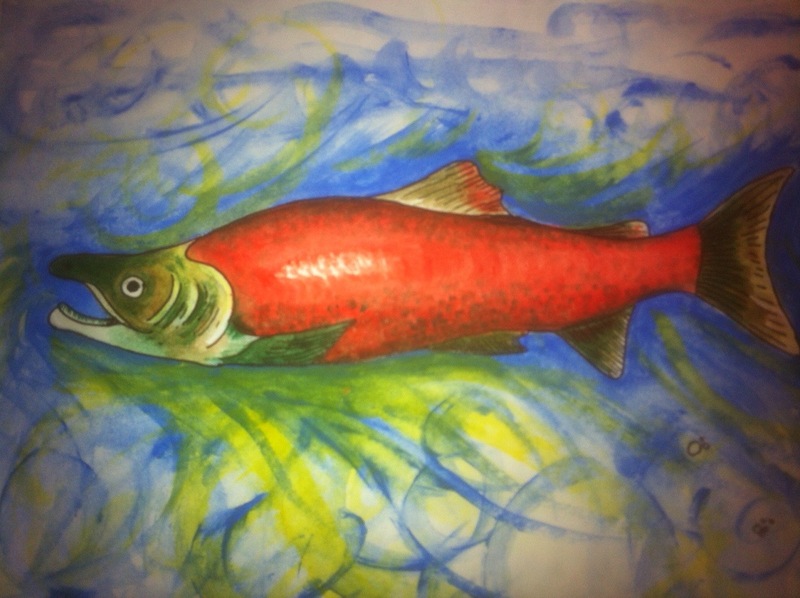 We began swimming with the sockeye salmon–the wise salmon (an oracle). To explore the place in between “here and there”—between where we are now, and where we want to be. The salmon were transmitting wisdom through the water to us just by virtue of us being in the water with them. There was a deep teaching at an energetic level about the integration of here, the gap and the future. A harmony and synergy. “As our vibration rises, we carry the power to attract people who have that energy needed for or related to the creation of the next step. ” If we employ a greater awareness, we will notice these people and this helps create the next step. We call on the Great Mystery for our Construction team of creation of the bridge between the here and the there: attracting circumstances, the elements, compassionate spirits, and people. As we raise our vibration, we know that we are in communion with the spirits. We engage them to build the bridge over the gap. This team is engaged, both intentionally and accidentally; without our initial awareness, then we notice the team and its components, and it builds exponentially. Our change in perception of energy is going to encourage change. A magnetic vibrational quality that emanates from the heart, along with change in perception of energy, is going to “synergize to create synergy”. A field forms around us. The awareness of this happening feeds creation of the steps of the bridge. The Wise Salmon clambered and implored: ”if no structure exists there right now, walk on our backs to peer into the gap”. “As you stand on the backs of the spirits in the elements: Notice the detail in the water (the gap)– this is really important for the foundation of what you are creating out in front of you. There is information in the gap. That serves as a foundation for for what you are building and creating. Above and below synergizing—keep watching how the land and the water interact”. I thank my client for attracting such an amazing healing shamanic journey with me.